Brad Befus has been flyfishing and fly tying for 29 years. He is an accomplished freshwater and saltwater angler who holds several I.G.F.A. flyrod world records and has fished many destinations worldwide. Fly fishing for carp is one of the hottest fishing challenges around; they're big, smart and are found almost everywhere. Join Brad Befus as he exposes the secrets of fly fishing for carp and learn the strategies and techniques of catching these challenging fish. Brad is an innovative fly tier with many of his patterns being produced and sold by Umpqua Feather Merchants through their "Contract Tier Program". His flies have appeared in books and articles, as well as the University of Idaho Prichards Art Gallery and the Boulder Museum of Contemporary Art. Brad co-authored with Barry Reynolds and John Berryman Carp on the Fly a flyrodders guide to carp! He has recently completed his second book Basic Techniques for Successful Fly Tying and has also has released three fly tying videos - Flies For Carp, Techniques for Micro Patterns and Basic Techniques for Successful Fly Tying. He frequently contributes articles and photography to many of the flyfishing periodicals. 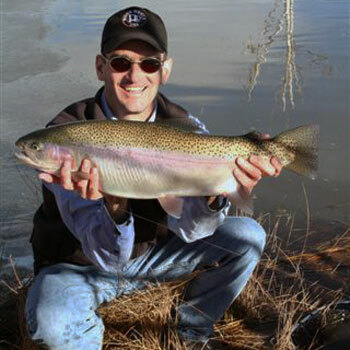 His vast knowledge of the sport of flyfishing and angling expertise make him a tremendous resource of angling, fly tying and casting information. Brad currently resides in Montrose, Colorado with his wife Lisa and their three children where he is the Sales Manager at Ross Reels.